The James R. Barker sailed into Fincantieri Bay Shipbuilding Company in Sturgeon Bay,Wis., last week where it will become Interlake Steamship Company’s first thousand footer and its second self-unloading bulk carrier to be outfitted with exhaust gas scrubbers. 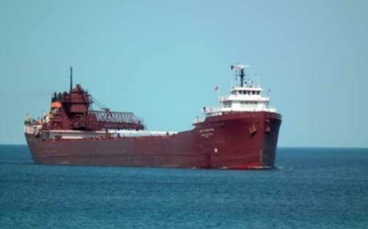 Interlake became the first US-flag fleet to test scrubbers on the Great Lakes in April 2015 after pioneering the emission- reduction technology on its Hon. James L. Oberstar. Fincantieri Bay Shipbuilding handled the successful installation on the 806-foot Oberstar and was the clear front-runner to earn the second phase of installations on two additional vessels —— the 1,004-foot Barker and the 826-foot Lee A.Tregurtha, which just arrived at the Wisconsin shipyard. During the multi-month project at Fincantieri Bay Shipbuilding, both vessels will be equipped with the same single- inlet, closed-loop DuPontTM Marine Scrubbers from Belco Technologies Corp. (BELCO), a DuPont company, that were installed on the Oberstar. The scrubber units, which are attached to the exhaust system of each of the ship’s two engines, effectively strip the majority of sulphur from its stack emissions. Here’s how the systems work: Exhaust gas from the engine is sent through a series of absorption sprays that ‘wash’ and remove impurities, specifically sulphur and particulate matter. That washed exhaust gas then travels through a droplet separator before a clean plume of white steam is discharged into the atmosphere. “The sulphur reductions we have been able to achieve in the first year of operation have exceeded our expectations,” says Barker, adding that the additional reductions of these emissions make an even stronger case for marine transportation — the most environmentally friendly way to deliver, in Interlake’s case, raw materials. As the first US-flag fleet to implement the scrubber technology, the company was not only tasked with proving its emission-reduction capability but also taking the lead in developing a sustainable supply-and-delivery infrastructure to support its widespread use on the Great Lakes. Specifically, the scrubber system relies on an injection of sodium hydroxide — to neutralize and remove sulphur from the exhaust gas — and that chemical has to be delivered to the vessel about twice a month. Working with partners, Hawkins Inc., PVS Chemicals Inc., Garrow Oil & Propane and OSI Environmental, the company has established waterfront supply capability at Sturgeon Bay,Wis., and Detroit, Mich. Calumet Specialties LLC has become a vital partner and stakeholder in the development of a new supply capability within the Twin Ports of Duluth, Minn., and Superior, Wis. A supply-and-delivery infrastructure is expected to be built out at ports located near East Chicago, Ill., and Burns Harbor, Ind. Headquartered in Middleburg Heights, Ohio, the Interlake Steamship Company was launched in 1913. For more than a century, the company has led the Great Lakes shipping industry through its commitment to flawless service, environmental stewardship and continuous innovation. ISO 9002 certified, Interlake’s fleet of nine vessels deliver raw materials to ports throughout the Great Lakes region.